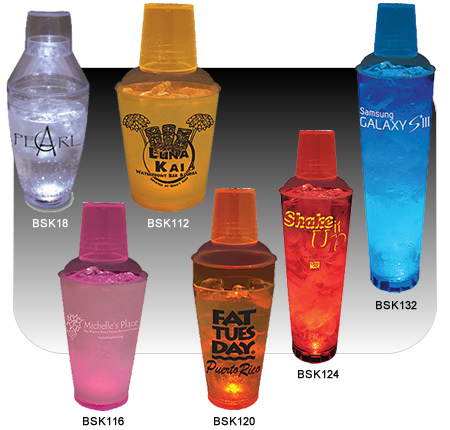 These Light-Up Customized Plastic Cocktail Shakers offer a fun, unique way to promote your organization. 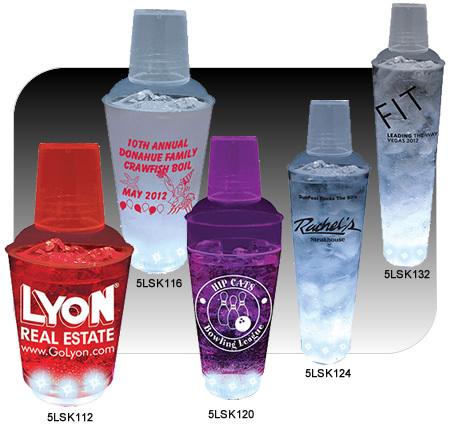 Customized Plastic Cocktail Shakers are great for bars, restaurants, clubs, special events, promotions, and much more. Single-Light, Three-Light, and Five-Light Custom Cocktail Shakers are available. 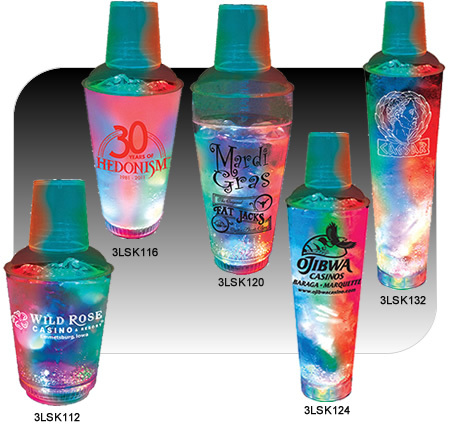 Each Custom Light-Up Plastic Cocktail Shaker features your logo and message in the imprint color of your choice. We offer a wide range of standard imprint colors, as well as PMS-matched colors. Standard production time is about two weeks after proof approval. Your satisfaction is guaranteed when you order Custom Imprinted Plastic Barware from us. Read our Plastic Shaker information below to find out more about our three styles of Custom Imprinted Lighted Cocktail Shakers. Our Single-Light Customized Plastic Cocktail Shakers come in five sizes with nine different LED light colors: Blue, Green, Orange, Pink, Red, Tri-Color, Violet, White, and Yellow. You can control the light effects with the push of a button to have either blinking or steady-state light effects. BSK18 8 oz. Single Light Cocktail Shaker $4.05 $3.65 $3.49 $3.35 $3.19 $3.13 2" 1.63"
BSK112 12 oz. Single Light Cocktail Shaker $4.11 $3.89 $3.73 $3.55 $3.43 $3.29 3" 3"
BSK116 16 oz. Single Light Cocktail Shaker $4.21 $3.99 $3.83 $3.65 $3.55 $3.43 3" 3"
BSK120 20 oz. Single Light Cocktail Shaker $4.43 $4.27 $4.09 $3.89 $3.83 $3.69 3" 3"
BSK124 24 oz. Single Light Cocktail Shaker $4.65 $4.49 $4.29 $4.13 $4.03 $3.89 3" 3"
BSK132 32 oz. Single Light Cocktail Shaker $4.97 $4.83 $4.71 $4.53 $4.33 $4.17 3" 3"
Our 3 Light Plastic Cocktail Shakers come in 12, 16, 20, 24, and 32 ounce sizes. Each Shaker features red, green, and blue lights. With a push button, you control the light actions. The Custom Imprinted Cocktail Shakers offer six light effects: all lights blinking, alternating fade, all one, red blinking, blue blinking, and green blinking. 3LSK112 12 oz. Three-Light Cocktail Shaker $4.59 $4.43 $4.25 $4.07 $3.97 $3.87 3" 3"
3LSK116 16 oz. Three-Light Cocktail Shaker $4.69 $4.53 $4.35 $4.17 $4.09 $3.93 3" 3"
3LSK120 20 oz. Three-Light Cocktail Shaker $4.93 $4.79 $4.59 $4.39 $4.29 $4.19 3" 3"
3LSK124 24 oz. Three-Light Cocktail Shaker $5.15 $4.99 $4.83 $4.63 $4.53 $4.37 3" 3"
3LSK132 32 oz. Three-Light Cocktail Shaker $5.49 $5.35 $5.23 $4.97 $4.89 $4.73 3" 3"
Our Custom Imprinted 5 Light Plastic Cocktail Shakers feature five super-bright LED lights, and they come in 12 to 32 ounce sizes. With the push of a button, you control the actions of the five LEDs. The Cocktail Shakers offer three light effects: spinning lights, blinking lights, and constant-on lights. 5LSK112 12 oz. Five-Light Cocktail Shaker $4.69 $4.53 $4.35 $4.23 $4.09 $3.89 3" 3"
5LSK116 16 oz. Five-Light Cocktail Shaker $4.79 $4.63 $4.45 $4.33 $4.17 $3.97 3" 3"
5LSK120 20 oz. Five-Light Cocktail Shaker $4.99 $4.89 $4.69 $4.55 $4.39 $4.19 3" 3"
5LSK124 24 oz. Five-Light Cocktail Shaker $5.23 $5.13 $4.93 $4.77 $4.63 $4.39 3" 3"
5LSK132 32 oz. Five-Light Cocktail Shaker $5.65 $5.49 $5.33 $5.15 $4.97 $4.75 3" 3"